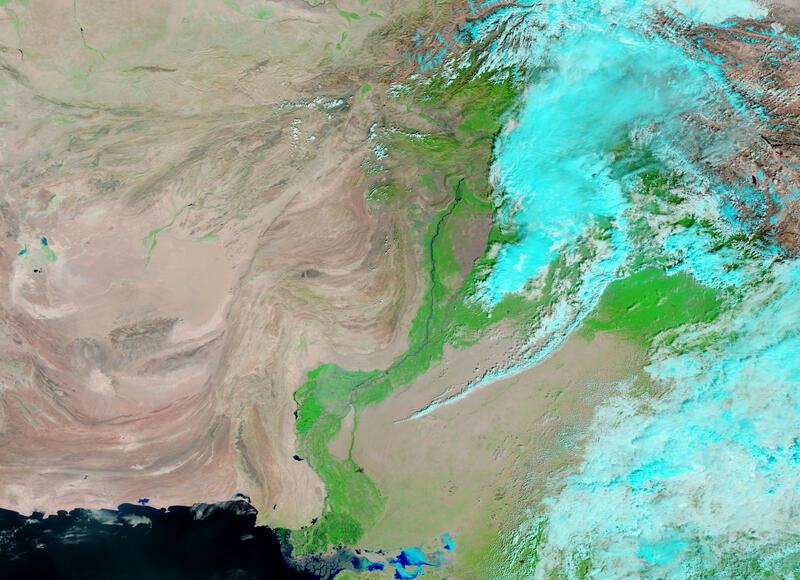 In early October 2010, flood conditions lingered in Pakistan, 11 weeks after the first monsoon floods struck the country. As of October 5, 2010, the United Nations High Commissioner for Refugees (UNHCR) stated that nearly 1.6 million residents remained displaced. Flooding was especially serious around Manchhar (or Manchar) Lake. 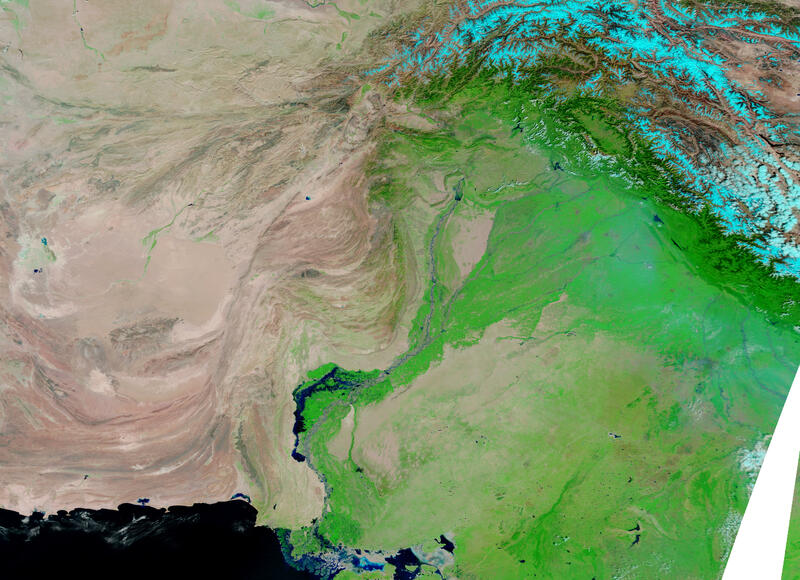 These images from the Moderate Resolution Imaging Spectroradiometer (MODIS) on NASA’s Terra satellite show the devastating changes to the landscape along part of the Indus River between October 4, 2009 (bottom) and October 5, 2010 (top). Both images use a combination of infrared and visible light to increase the contrast between water and land. Vegetation is bright green. Bare land ranges in color from pink-beige to brick-red. Clouds are pale blue-green. Water ranges in color from electric blue to navy. 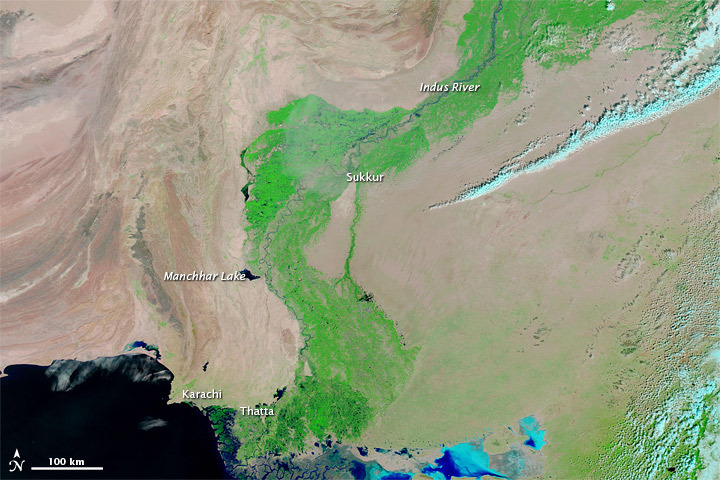 In both images, the Indus appears as a thin, meandering river, although in the 2010 image, the river valley appears to have been scoured by flood waters, leaving behind less vegetation. The most dramatic differences, however, occur near the coast, east of Thatta and west of the river in Sukkur. 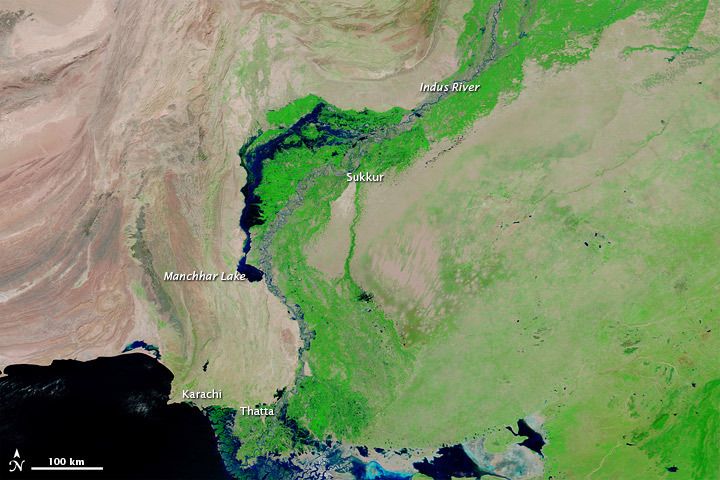 In August and September 2010, flood waters created a massive lake west of the Indus River, terminating in Manchhar Lake, which proceeded to rise rapidly. A UNHCR spokesperson stated that flooding in this lake had placed additional strains on nearby refugee camps, which were already overcrowded. Accessed October 5, 2010, and October 4, 2009, these false-color images show changes to the landscape wrought by the devastating 2010 monsoon season. UNHCR. (2010, October 5). Pakistan: 11 weeks on from the first floods, acute problems still remain. ReliefWeb. Accessed October 5, 2010.